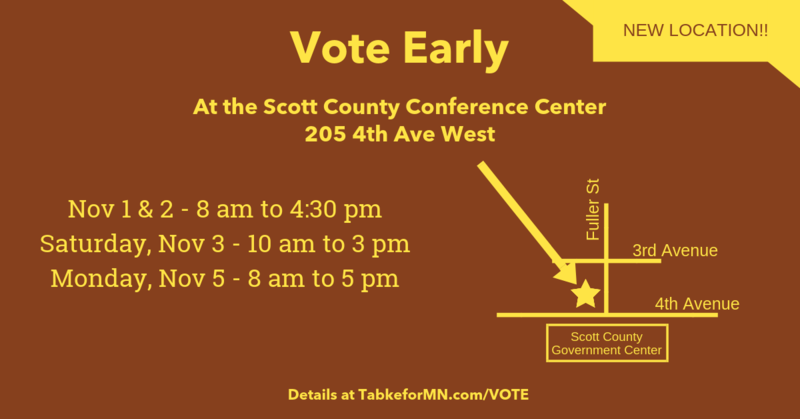 Voters in Shakopee, Jackson Township, and Louisville Township can vote early beginning Friday, September 21, 2018. You have a couple of great options of how to get this done. Read the instructions that come with your ballot carefully. You will need a witness when you vote and complete your ballot. The witness can be either a registered Minnesota voter or a notary. Mail the ballot and forms back right away after you finish. Your ballot will not count if it is received after Election Day. A: Yes. You can change your vote until one week before the election. Q: How do I know if my ballot was received? A: You can track your ballot with this nifty tool here --> Track My Ballot. Q: Do you recommend voting early? A: Yes. If you have any concern whether you'll be too busy or something may come up on election day, definitely take advantage of this option. Register to Vote Online - ONLINE REGISTRATION ENDED TUESDAY, OCTOBER 16 AT 11:59 PM!! This is the easiest way to register. Click here to register online with the MN Secretary of State. Not sure if you are registered? Click here. If you aren't registered to vote on Election Day - YOU CAN REGISTER at your polling place on Election Day. Learn how here. Your ballot may differ from these based on where you live within each community. Check the sample ballot specifically for you here. Again, you can find your polling location here ---> Polling Locations. Precinct 5: Youth Building at Lions Park, 1099 Adams St. If you have any other questions, check out MNVOTES.org. There is a ton of great information there. Thank you for voting! !